Well, I have good news! You can directly tell SOLIDWORKS your idea. It’s called an Enhancement Request (ER) and it’s an option available via your SOLIDWORKS ID account. If you don’t have a portal account, you’ll have to create one first. Visit https://login.solidworks.com to get started. STEP 1: Search for any existing Enhancements fitting your situation. If any are found you can add your comments and vote for the enhancement. Your vote adds another customer “hit” to the enhancement. The more “hits”, the higher the priority the enhancement will receive. STEP 2: If no existing enhancement is found, create and submit a new one. You’ll receive an ER # for your records, and you’ll have an opportunity to attach files if you feel it would help. Product Definition Management and Development reviews each and every enhancement to assess their feasibility and implementation difficulty to see when and if they may be able to integrate it. It’s important to note that not every enhancement will make it into the software and that some, due to the scope of the implementation, may take a few years to make it in. If you contact our Tech Support Help Desk requesting we submit an ER on your behalf, we will instead like to show you how you can submit it yourself. There are a couple of reasons for this. Ensures the ER gets associated to YOU and that they have your current contact information. There have been times when their Development begins looking at an ER and has additional questions or need clarification on the request. They will reach out to you directly to get that. This ensures that they are fulfilling the ER correctly to satisfy your needs. 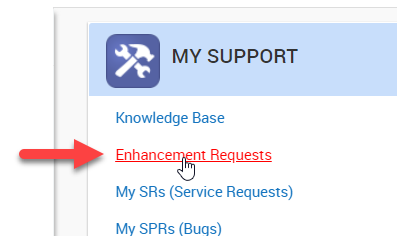 Nothing worse than being told an enhancement has been added, only to come to find out when you test it out that it’s incorrect or doesn’t fully achieve what you’re after. You are uniquely and best qualified to describe the request and problem driving it. We strive to best and fully understand your requirements and the reasons behind it, but a miscommunication could occur and we may not properly understood or explained the problem and request accurately, per your needs. In times like this, when it comes to the enhancement and evolution of the software, it’s recommended you communicate directly with SOLIDWORKS. With these reasons in mind, we will politely decline and suggest that you complete the Enhance Request yourself. We are happy to assist you with your first ER submission by talking you through it or even remotely walking you through it to introduce you to the process. Experiencing problems when you load the SOLIDWORKS Toolbox add-in? Improve your SOLIDWORKS Weldments with Configurations! Technical Support Manager at Javelin Technologies; manages team of almost 20 support technicians who provide post-sales technical support, training, and consulting relating to SOLIDWORKS 3D CAD design packages, PDM file management, SIMULATION stress analysis, ELECTRICAL and PCB design, COMPOSER and VISUALIZE, and more, to our customers. First exposure to SOLIDWORKS was the 98Plus version in my prior life as a mechanical designer prior to January 2005 when I joined Javelin.